Carrying a first aid kit in your car is an essential, especially while travelling. 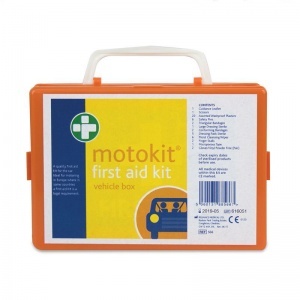 The Motokit Compact Vehicle First Aid Kit ensures that you are well-prepared if ever emergency strikes. It's not just safe and sensible to carry a first aid kit in your car, in some European countries it's the law to always carry one while driving around. It's important to check ahead of travelling what provisions are compulsory to carry around with you during your visit to avoid an on-the-spot fine. What Is Included in the Compact Motokit? The Compact Motokit is an all-purpose motoring kit that has been designed for use both at home and abroad. 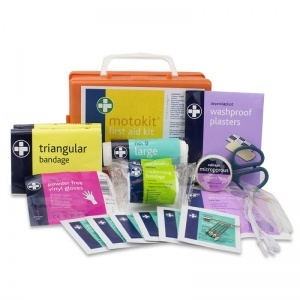 Kept in a secure, high visibility orange box, all contents have been approved by medical professionals for use by those who are not necessarily trained in first aid. The Motokit Compact Vehicle First Aid Kit is usually dispatched via First Class Royal Mail and delivery should be within 1 to 3 working days.